George Mosson (1851-1933), French-German Impressionist School Oil on canvas . Mosson, who was born in Alsace-Lorain and moved to Berlin when 14 years old, was a founder member of the 'Berliner Secession' an art association founded in Berlin in 1898 as an alternative to the state run 'Association of Berlin Artists' which opposed the new impressionist movement. Mosson was part of the selection jury for the Berlin Secession Exhibition in 1908. 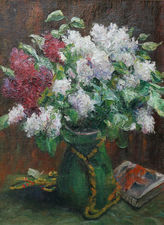 His main works focused on impressionist landscapes and still life of which this is one. His works are on display in the Berlin National Gallery.